Introduction: Infiltrant resins were developed to hamper carious lesion progression and mask the whitish appearance of first evidence of caries. Objective: This study aimed at testing the hypothesis that a long application time of resin infiltrant in proximal enamel caries improves esthetic outcome compared to the commercially recommended time. Materials and Methods: Twenty teeth with uncavitated inactive proximal white enamel caries lesions (selected by two calibrated examiners; inter-examiner κ = 0.87) were divided into two groups (experimental and control group; n = 10) that agreed regarding lesion surface area. Lesions were infiltrated following the protocol recommended by the manufacturer (two applications, 3 min application first and another 1 min application later; control) and by the protocol tested in this study (one application of 30 min; experimental). Enamel opaqueness (esthetic outcome) was measured by a calibrated examiner (intra-class coefficient of 0.9) before and after infiltration using fluorescence microscopy. Results: Reduction of enamel opaqueness was significantly higher in the experimental group (40.0% ± 18.5%) than in the control group (18.6% ± 14.9%) (P = 0.0105, one-tailed t-test; Hedge's g of 1.28, 95% confidence interval of 0.43/2.13, and power of 86%). Conclusions: It can be concluded that the application time of 30 min provides a greater reduction in opaqueness of proximal enamel lesion compared to the application time recommended by the manufacturer. The high effect size could stimulate patients to comply with the treatment time. The first macroscopic evidence of caries can be seen in a tooth as a small white-opaque area in enamel, whose appearance is due to an increased porosity within the lesion body. The increased porosity of carious enamel facilitates the penetration of fluid resin into enamel pores by capillarity, and hence that the advent of low viscous resins – so-called caries infiltrant (penetration coefficient >50 cm/s) – is based on the infiltration of those pores with curable resins that could occlude the pathways for cariogenic acid and thus, hampering/arresting lesion progression. Lesions once filled by the caries infiltrant, which presents a refractive index (RI; RI of 1.52) relatively similar to that of enamel hydroxyapatite (RI of 1.62), a positive side effect accompanies: partial masking of the whitish appearance of the enamel lesion. This positive side effect seems to be stable even after further demineralization in vitro. Transport through the enamel pores is related to the organic contents and water, the latter divided into firmly and loosely bounded water. Part of the loosely bound water is replaced by air after dehydration of the lesion at room temperature. The pore space filled with air before infiltration is available to be filled by the infiltrant transported through enamel pores by capillary action. According to Washburn equation, the displacement of a liquid into capillaries is directly proportional to the time. Quantification of the component volumes in enamel pores is considered important for the analysis of the pore volume filled with the caries infiltrant, since it is expected that the infiltrant replaces, at maximum, the loosely bound water volume in the enamel carious lesion. According to Meira et al., spaces remain filled with organic, firmly bound water, and air in carious enamel pores even after infiltration of liquids with higher penetration coefficients for long time intervals (24 h). Applying solutions (with significantly higher penetration coefficients than infiltrants) in caries lesions by capillarity, it was reported that the lesions were still partially filled even after 24 h of application. The current application time for the caries infiltrant is <5 min (Icon manufacturer's protocol: two applications, 3 min and 1 min). The study of Meira et al. suggests that caries infiltrants might be able to fill a larger volume of enamel caries lesions if an application time longer than the recommended one is used. Clearly short application times are more clinically feasible (e.g., for patients' convenience) than longer ones, but improvements in esthetic outcomes of caries infiltration should not be necessarily limited by an application time of 4–5 min. The aim of this in vitro study was to test the hypothesis that an application time of 30 min of caries infiltrant results in an improved esthetic outcome compared to the time recommended by the manufacturer (4 min). Twenty extracted erupted humans third molars were collected from volunteers after signing an informed written consent approved by the Ethical Committee on Research in Humans of the Lauro Wanderley Hospital at the Federal University of Paraiba (Brazil). Uncavitated inactive white enamel carious lesions, based on Nyvad criteria, were selected using stereomicroscopy (Opticon, Nanjing, China) by a calibrated examiner (κ = 0.87). Biofilm was removed using 1% sodium hypochlorite, applied on the tooth surface for 30 with a cotton pellet, and the surface was dried with compressed air for 30 s. A shiny white appearance was indicative of inactive enamel proximal lesions (one lesion per tooth). Each proximal surface was fixed on the stage of a stereomicroscope under the reflected light to obtain digital photomicrographs. The lesion area was measured using free software of image analysis (ImageJ, NIH, Bethesda, Maryland, USA). The lesion areas were ordered from the largest to the smallest, and pairs of lesions with similar lesion area were selected. A lesion of each pair was allocated in either control or experimental group so that each group presented similar lesion areas. Agreement between groups regarding lesion area was performed using Bland and Altman plot with pairs of lesions (one from each group). Once again, each tooth was fixed on the stage of the stereomicroscope equipped with a fluorescence accessory (excitation filter at 480 nm and emission filter at 520 nm; Nightsea, Lexington, USA) and a digital camera in black and white mode (Nikon D7000, Tokyo, Japan). Both the tooth and the fluorescence light source (used before and after infiltration) remained at fixed positions throughout the experimental procedure (pre-, trans-, and post-infiltration). Fluorescence images were obtained before and after caries infiltration. The caries infiltration procedure was performed with the tooth fixed on the stage of the stereomicroscope. The infiltrant Icon (DMG, Hamburg, Germany; Lot number 724088) was applied to the surface of the lesions following the manufacturer's protocol (acid etching for 2 min, followed by water rinsing for 30 s, air drying, application of 99% ethanol for 30 s, air drying, application of infiltrant for 3 min, light-curing for 40 s, new application of infiltrant for 1 min, and light-curing for 40 s; control group) or the experimental protocol (acid etching for 2 min, followed by water rinsing for 30 s, air drying, application of 99% ethanol for 30 s, air drying, application of infiltrant for 30 min, light-curing for 40 s; experimental group). Any other manufacturers' recommendations were followed in both groups. L1 is the mean gray level of the lesion area before application of the infiltrant. N1 is the mean gray level of the normal enamel area before application of the infiltrant. L2 is the mean gray level of the lesion area after application of the infiltrant. Moreover, N1 is the mean gray level of the normal enamel area after application of the infiltrant. Values of ΔOp were used for hypothesis testing. The sample size was calculated considering a one-tailed alpha error of 5% (because experimental groups were expected to be better, not worse, than the control group), a large effect size of 1.2, and power of 80%, resulting in 10 lesions per group. Data on the percent reduction in enamel opaqueness from both control and experimental groups presented normal distribution according to the Shapiro–Wilk test. Unpaired t-test (1-tailed significance level of 5%) was used to test differences between groups, along with Hedge's g effect size (and its 95% confidence interval [CI]), and statistical power. Analysis using Bland and Altman plot revealed a good agreement between groups regarding lesion area. 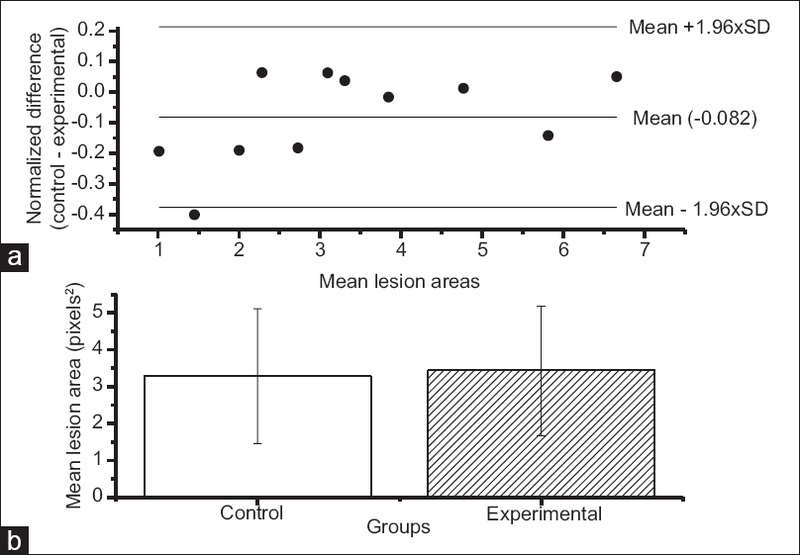 A small mean difference of 0.08 was detected (the experimental group had slightly larger lesion area) [Figure 1]a. Corresponding bar plot of the mean lesion areas (± standard deviation) area is shown in [Figure 1]b. Typical features of enamel caries lesion area before and after resin infiltration are shown in [Figure 2]. The reduction in enamel opaqueness can be seen by an increased fluorescence intensity, which gets closer to that of the adjacent normal enamel. Values for fluorescence intensity in the lesion area and in the adjacent normal enamel, the ratio of the fluorescence intensity in normal enamel by the fluorescence intensity in lesion area, before and after infiltrant application, and the percent reduction in enamel opaqueness are shown in [Table 1] and [Table 2], for control and experimental groups, respectively. The mean reduction in enamel opaqueness was 18.6% (±14.9%) for the control group and 40% (±18.5%) for the experimental group. The reduction in enamel opaqueness was higher in the experimental group (P = 0.00105; unpaired t-test) with a high effect size (Hedge's g = 1.28; 95% CI = 0.43/2.13; and statistical power of 86%). The treatment of noncavitated enamel carious lesions by infiltration has been proved to be an effective alternative to other noninvasive, including fluoride therapies., The infiltration with the resin infiltrant aims to reduce the enamel lesion porosity, acting as a barrier against the diffusion of acids, thus reducing caries progression. As this is the main purpose of the infiltrant, it is expected that the resin replaces the total water and air component present in the lesion, penetrating as much as possible the available volume in the pores. Theoretically, the higher the penetration depth of the infiltrant, the higher the esthetic outcome. Thus, the opaqueness measured at the surface of the carious enamel is expected to be associated with the extent of resin infiltration in the carious enamel lesion. In the present study, the application of the infiltrant for an application time much longer than that recommended by the manufacturer was evaluated for the first time, resulting in an improved esthetic outcome (reduction of enamel opaqueness). Despite the improved esthetic outcome with the longer application time, a considerable percentage of enamel opaqueness remained after caries infiltration in the experimental group [Table 2]. This disagrees with previous case report showing a complete reduction of enamel opaqueness in enamel caries lesion, but it is consistent with the report of the occurrence of various noninfiltrated pore volumes in both active and inactive enamel proximal caries lesions after caries infiltration using manufacturer's protocol. After dehydration, the available pore volume for infiltration is the total enamel pore volume minus the organic and firmly bound water volumes. Possibly, the enamel opaqueness remained after caries infiltration is a result of incomplete replacement of air by the infiltrant in the available enamel pore volume. One important factor that should be considered is the competition between the inward flow of infiltrant and the outward flow of air from the carious enamel pores that occurs during infiltration of liquids into dry porous hard materials. The coverage of the entire enamel caries surface by the infiltrant might result in a low rate of outward air flow so that long infiltration time might be needed to completely fill the available enamel pore volume. Studies on the nature of air outflow from dry enamel caries lesions should be carried out to elucidate the physics behind the concomitant flows of infiltrant and air that occur during caries infiltration. A previous study reported that 3 min infiltrant application time is similar (regarding infiltrated lesion area) to a 5 min application time, resulting in the recommendation of application time of 3 min for the first application of the protocol of two applications. Definitely, short application times are more clinically convenient and attractive to patients, but the choice for the proper application time should be based on the balance between outcome and application time. We argue that a 30 min application time might be clinically acceptable for patients once the improved outcome is highlighted. In some cases, the probability of a higher esthetic outcome might be decisive for choosing a long application protocol. Available evidence indicates that infiltration of liquids with high penetration coefficient (>2000 cm/s) into enamel caries lesions requires of 24 h or more to completely replace air by the infiltrant, so that caries infiltration-with penetration coefficient of 204 cm/s might probably result only in partial replacement of air by the infiltrant. On this basis, investigations of long but clinically feasible application times are justified, not only for the esthetic outcome but also for the caries inactivation outcome. That the single infiltrant application of 30 min resulted (with a high effect size) in an improved esthetic outcome in proximal enamel caries lesions compared to the manufacturer's recommended protocol (two applications: 3 min and 1 min). A master scholarship and an undergraduate research scholarship given by CNPq (Brazilian Ministry of Science, Technology, Innovation and Communications) for the first and second authors, respectively, are greatly acknowledged. Kidd EA, Fejerskov O. What constitutes dental caries? Histopathology of carious enamel and dentin related to the action of cariogenic biofilms. J Dent Res 2004;83:C35-8. Paris S, Meyer-Lueckel H, Cölfen H, Kielbassa AM. Penetration coefficients of commercially available and experimental composites intended to infiltrate enamel carious lesions. Dent Mater 2007;23:742-8. Kim S, Kim EY, Jeong TS, Kim JW. The evaluation of resin infiltration for masking labial enamel white spot lesions. Int J Paediatr Dent 2011;21:241-8. Rocha Gomes Torres C, Borges AB, Torres LM, Gomes IS, de Oliveira RS. Effect of caries infiltration technique and fluoride therapy on the colour masking of white spot lesions. J Dent 2011;39:202-7. Atkinson HF. An investigation into the permeability of human enamel using osmotic methods. Br Dent J 1947;83:205-14. Sousa FB, Vianna SS, Santos-Magalhães NS. A new approach for improving the birefringence analysis of dental enamel mineral content using polarizing microscopy. J Microsc 2006;221:79-83. Setally Azevedo Macena M, de Alencar e Silva Leite ML, de Lima Gouveia C, de Lima TA, Athayde PA, de Sousa FB, et al. A comparative study on component volumes from outer to inner dental enamel in relation to enamel tufts. Arch Oral Biol 2014;59:568-77. Meyer-Lueckel H, Paris S, Ekstrand KR. Caries Management – Science and Clinical Practice. New York: Thieme; 2013. p. 246-55. Washburn EW. The dynamics of capillary flow. Phys Rev 1921;17:273-83. Meira KR, de Mattos Brito CS, de Sousa FB. Predicting infiltration of the surface layer of natural enamel caries. Arch Oral Biol 2015;60:883-93. Nyvad B, Machiulskiene V, Baelum V. Reliability of a new caries diagnostic system differentiating between active and inactive caries lesions. Caries Res 1999;33:252-60. Bland JM, Altman DG. Statistical methods for assessing agreement between two methods of clinical measurement. Lancet 1986;1:307-10. Meyer-Lueckel H, Paris S. Caries infiltration. In: Meyer-Lueckel H, Paris S, Ekstrand KR, editors. Caries Management-Science and Clinical Practice. Stuttgart: Thieme; 2013. p. 246-58. Meyer-Lueckel H, Balbach A, Schikowsky C, Bitter K, Paris S. Pragmatic RCT on the efficacy of proximal caries infiltration. J Dent Res 2016;95:531-6. Paris S, Meyer-Lueckel H. Masking of labial enamel white spot lesions by resin infiltration – A clinical report. Quintessence Int 2009;40:713-8. Neuhaus KW, Schlafer S, Lussi A, Nyvad B. Infiltration of natural caries lesions in relation to their activity status and acid pretreatment in vitro. Caries Res 2013;47:203-10. Joung YS, Buie CR. Aerosol generation by raindrop impact on soil. Nat Commun 2015;6:6083. Meyer-Lueckel H, Chatzidakis A, Naumann M, Dörfer CE, Paris S. Influence of application time on penetration of an infiltrant into natural enamel caries. J Dent 2011;39:465-9. Meyer-Lueckel H, Paris S. Infiltration of natural caries lesions with experimental resins differing in penetration coefficients and ethanol addition. Caries Res 2010;44:408-14.